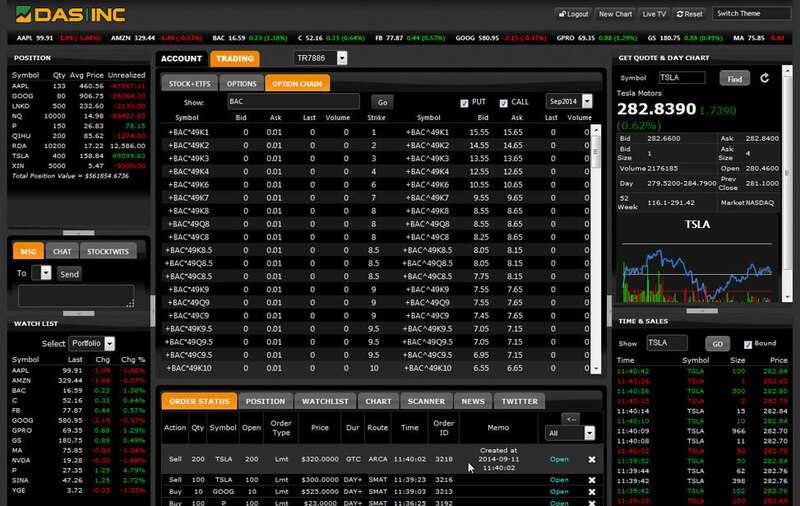 We offer the Brokerage and Trading Community an end-to-end electronic trading solution. Direct Access Software provides the reliability and access that your clients can count on. We provide the most efficient execution solutions for your clients, Broker/Dealers, Clearing Firms, On-Line Brokers, Institutional Trading desks, and traders worldwide that demand smarter execution services. Historical Reports - trades, orders, prices, and logs. 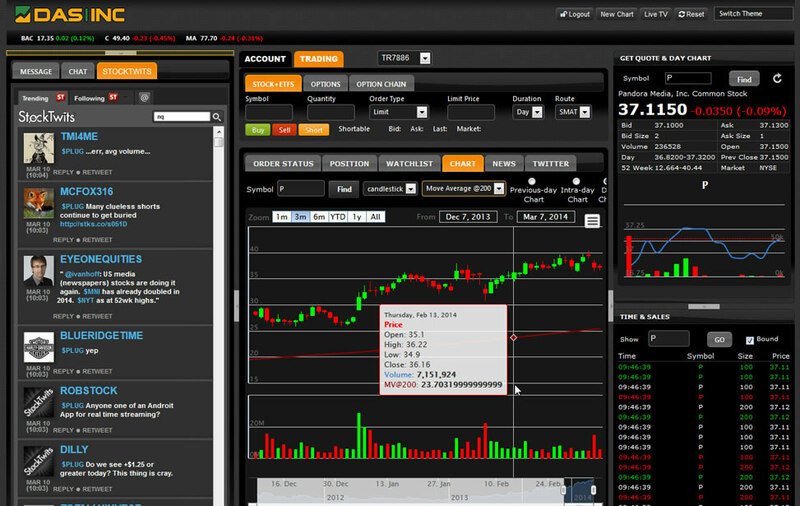 Send orders, view real-time market data, and set up alerts and hot keys. 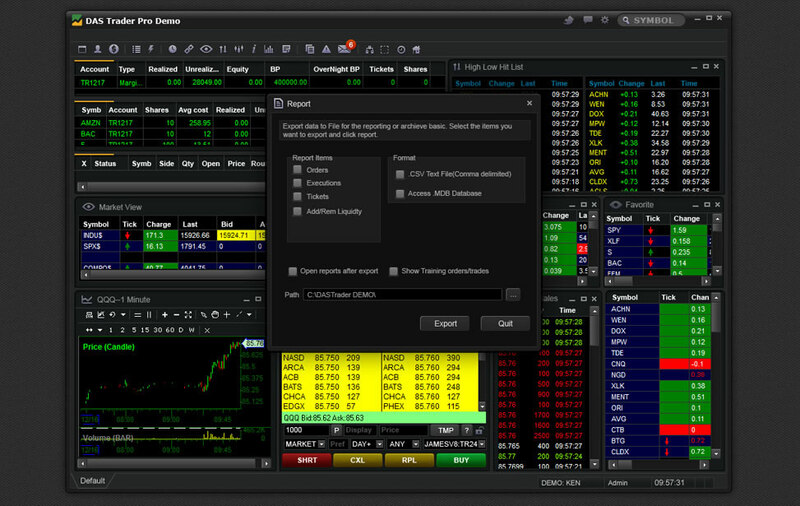 DAS Trader PRO is intended and fully tested to be used in a Windows environment. FREE live webinars: Intro to DAS every Wednesday. Direct Access Software (DAS) is an Industry Leader in direct access trading technologies that offer the brokerage and trading community end-to-end electronic trading solutions. DAS systems provide the most efficient execution and real-time market data solutions for your firm's clients, broker/dealers, clearing firms, online Brokers, institutional trading desks, and traders worldwide who demand smarter execution services and streaming market data. 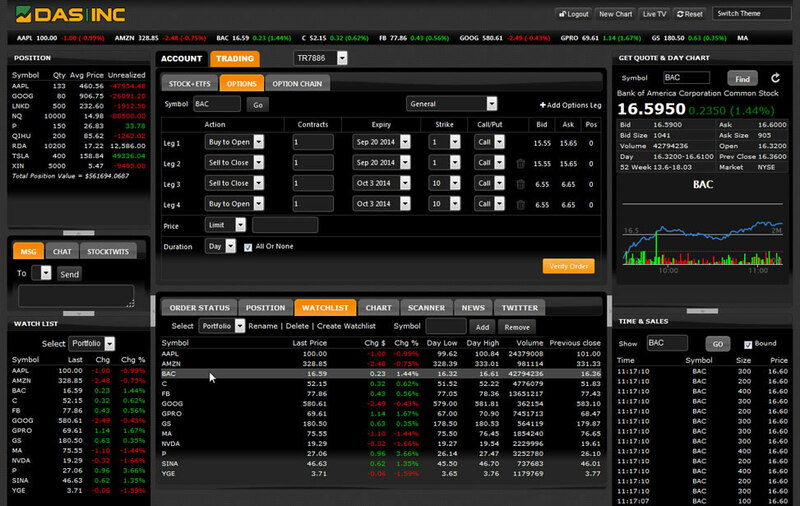 DAS is a market data provider for the CBSX, Nasdaq OMX, NYSE/ARCA, Direct Edge, OTC Markets, CBOE/OPRA and BATS. DAS is a connectivity provider for low latency order validation to the CBSX, Nasdaq OMX, NYSE/ARCA, BATS and Direct Edge. We provide direct market access and FIX connectivity to all the major exchanges and offer co-location services to the Nasdaq and SFTI data centers. Order Routing is available to over 50+ destinations with the most latency-sensitive sub-millisecond order validation. 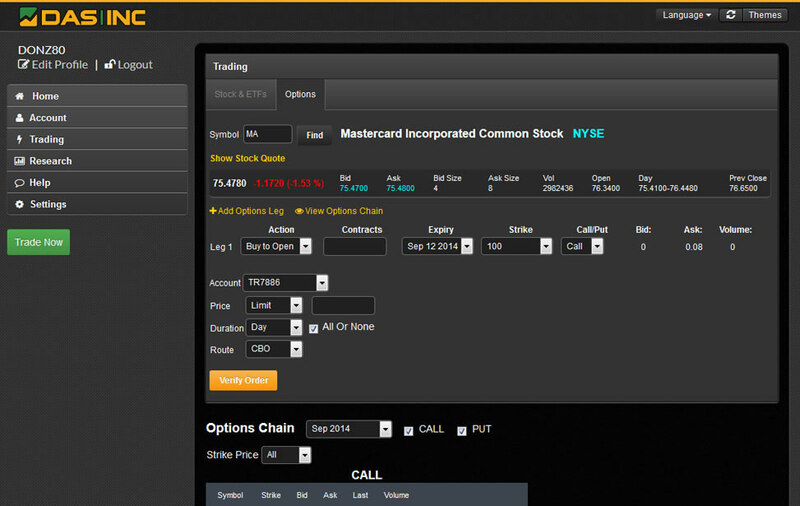 We also provide access to all NYSE floor brokers and routing strategies for exchanges, ALGO, dark pools and liquidity providers. We are continually committed to improving the reliability of our software technology and have specifically designed our platform in a way that takes into consideration the scalability and needs of our clients. 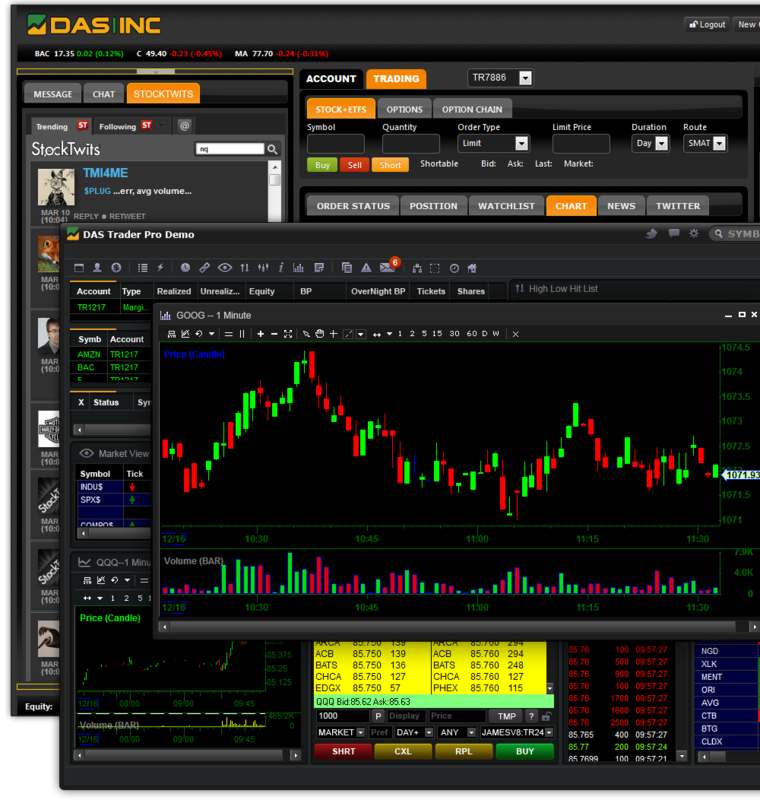 DAS Inc provides complete online brokerage solutions including direct access trading applications, browser-based trading, back-office order management systems, market data feeds, historical data, service bureau connectivity, FIX and API execution services. Get to know our team members. With more than 10 years of financial accounting, back-office management, broker dealer relations and information technology experience, Karen Barker-Gentile brings to DAS, Inc. a wealth of business and management experience. Prior to founding DAS, Inc. Karen worked in the corporate, civil and private sectors. We provide the most efficient execution and real-time market data solutions for your clients, Broker/Dealers, Clearing Firms, On-Line Brokers, Institutional Trading desks, and traders worldwide who demand smarter execution services and streaming market data. DAS Trader CSB – Connectivity Service Bureau (CSB) is a full suite of execution gateway solutions for clients who require global connectivity and reliability to all US Exchange centers. Besides being a platinum service bureau partner to NASDAQ OMX and a Power Partner 3 to NYSE Euronext, DAS is also a certified service bureau to CBSX, BATS, Direct Edge and several Electronic Communication Networks (ECN) or Alternative Trading Systems (ATS). 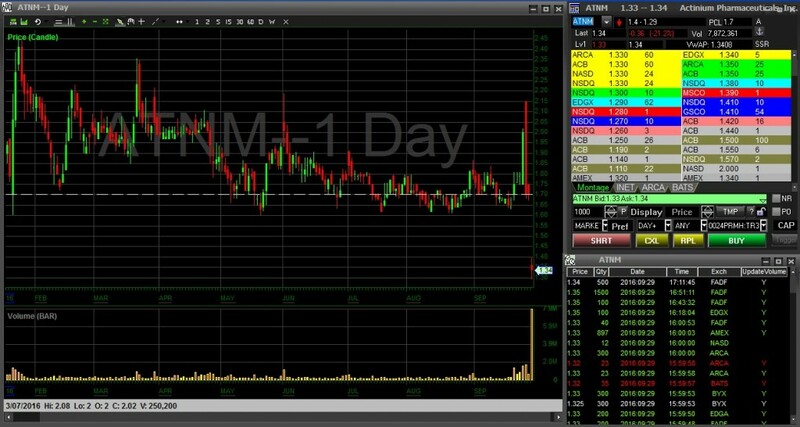 DAS Trader MDV – Market Data Vendor (MDV) to major exchanges including Nasdaq, NYSE, OPRA, OTC Markets, Direct Edge and BATS. 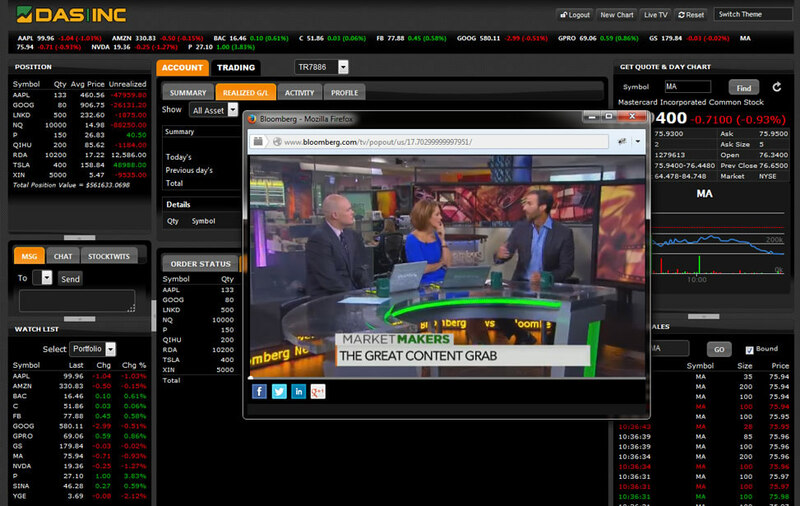 DAS|MDV offers real-time data feed technology for instant access to market data and real-time streaming news from Newsware. 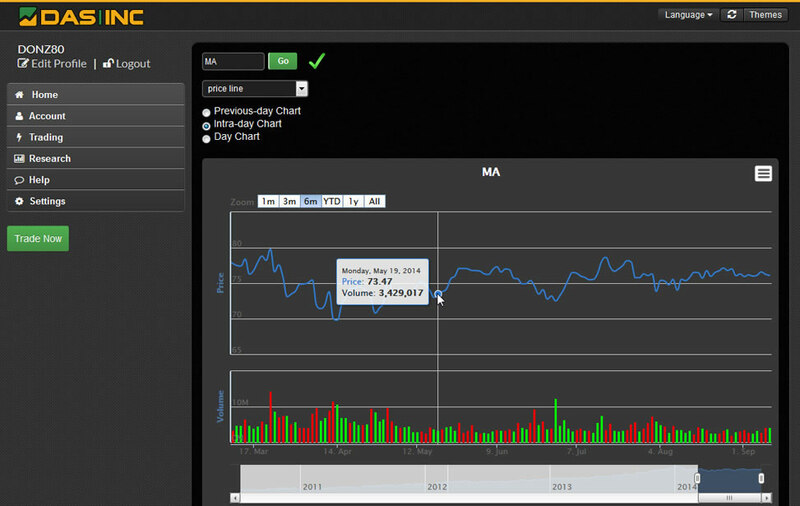 DAS is a preferred partner with Nasdaq OMX as a reseller of the Nasdaq Totalview. 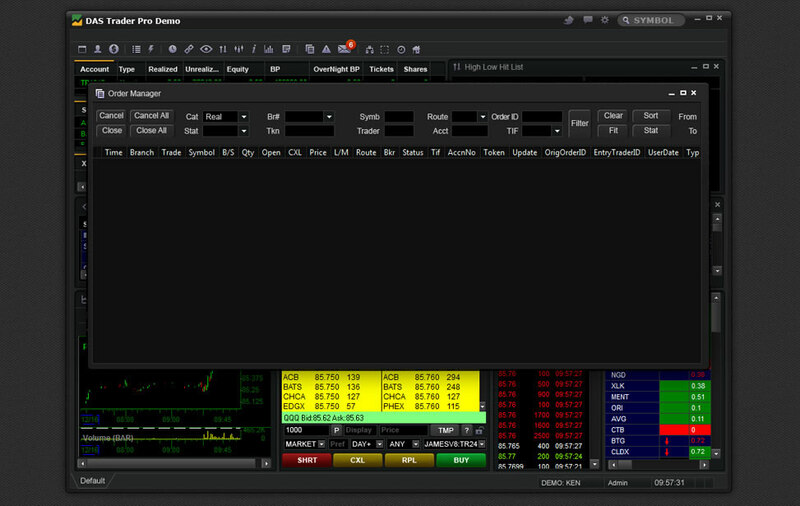 DAS Trader DEV – Offering front-end GUI interfaces the ability to connect to our robust backend system via the DAS|API and DAS|FIX, utilizing the DAS|DMA and DAS|CSB in routing technology to multiple exchanges and destinations available in our infrastructure. We also provide a full testing environment for developers. 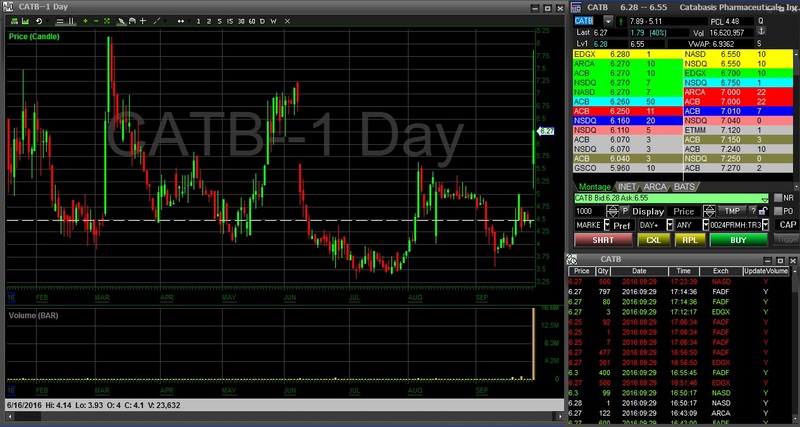 DAS Trader TRT – Trade Reporting tools (TRT) is a fully integrated front-to-back office suite of broker and firm management tools. 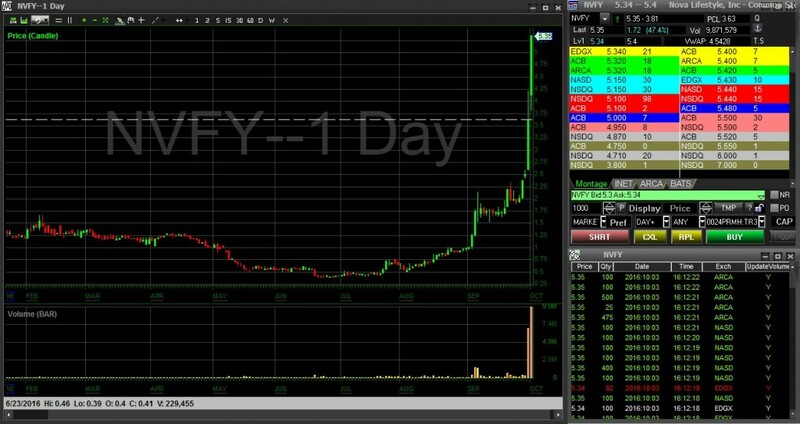 Brokers and brokerage firms can monitor and manage the real-time performance of their firm or portfolio and utilize risk and compliance management tools. These tools compliment the DAS products and provide additional detail to assist firms in its daily operation and surveillance. 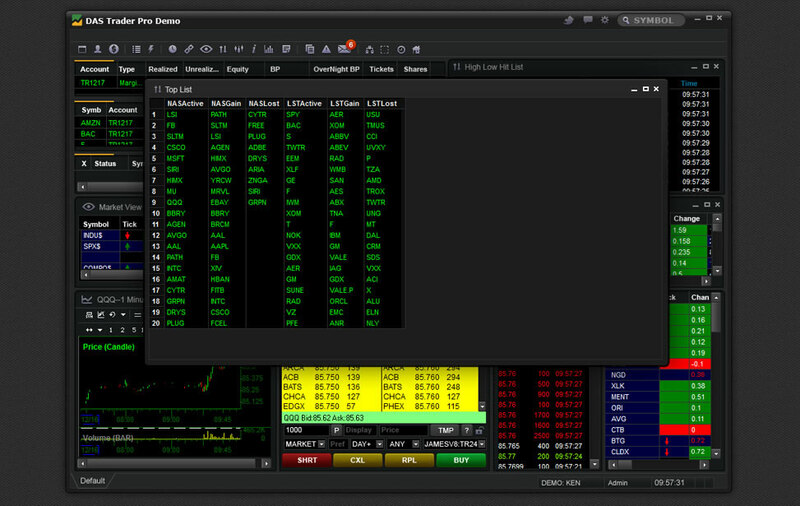 DAS Trader HUB – Collocation Services at NASDAQ with gigabit connection pipes to all major exchanges. 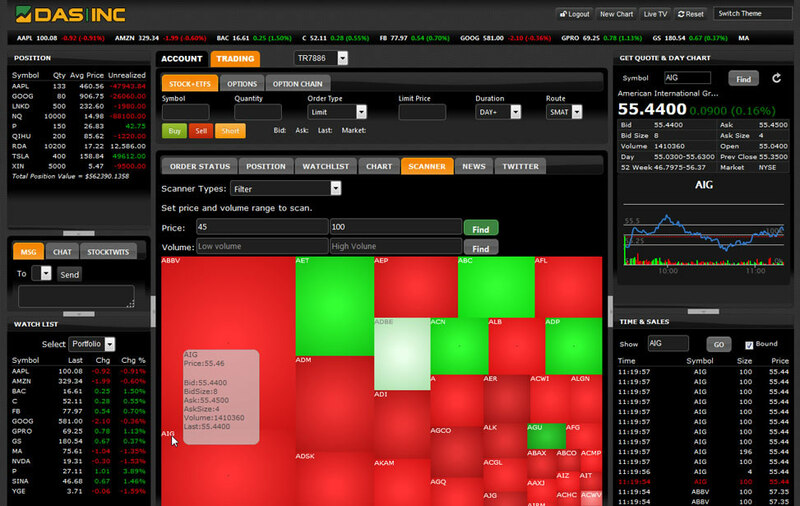 DAS|HUB provides a competitive edge for high frequency and automated traders, market data analysis. DAS's product suite is the solution and technology necessary for your firm to connect to the global market. We are committed to continually improving the reliability of our software technology and have specifically designed our platform to consider the scalability and needs of our clients. 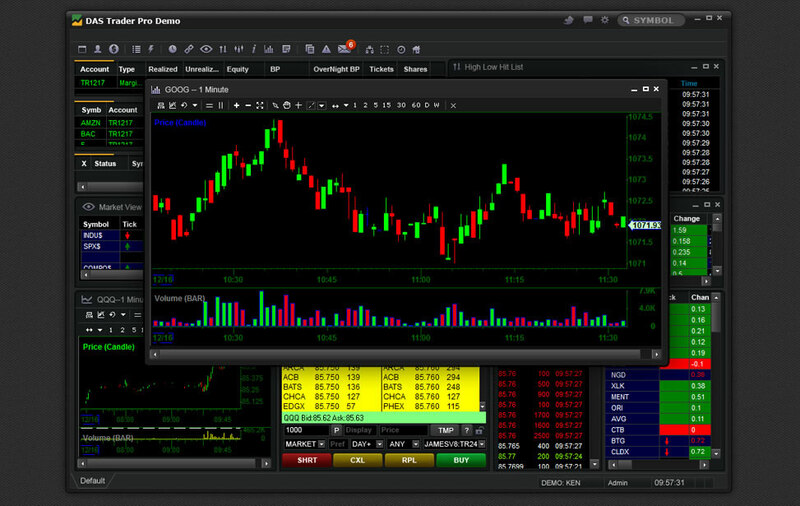 DAS Trader Professional trading platform with advanced order types, charting, and multi-account management in a real-time environment. 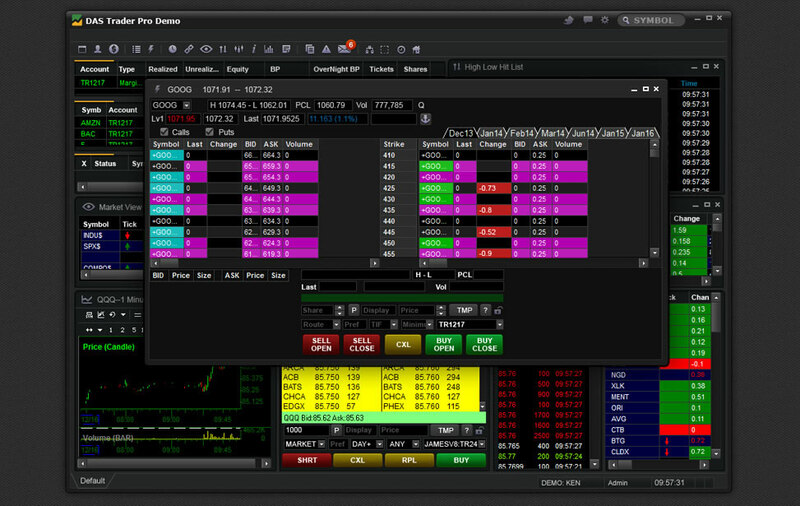 DAS ActiveWeb Trader is an advanced browser-based platform for trading equities and options built on HTML5 and uses Web Socket technology to stream real-time feed. 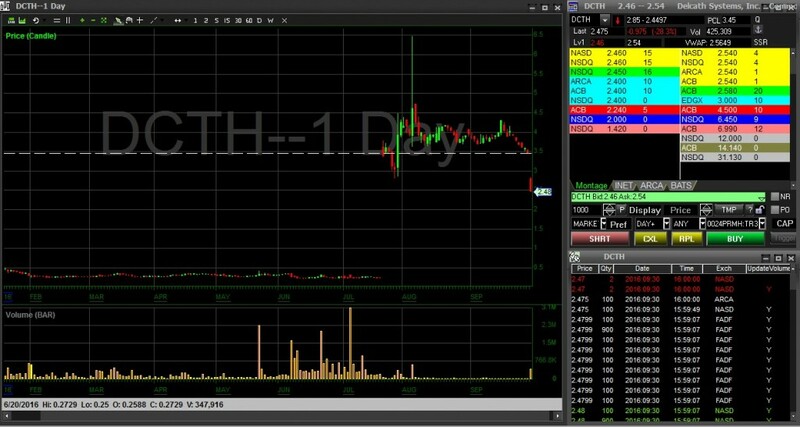 This platform combines the direct access trading capabilities of DAS Trader Pro with an intuitive web-based platform that can be customized to compete with other top-tier online brokerage solutions. 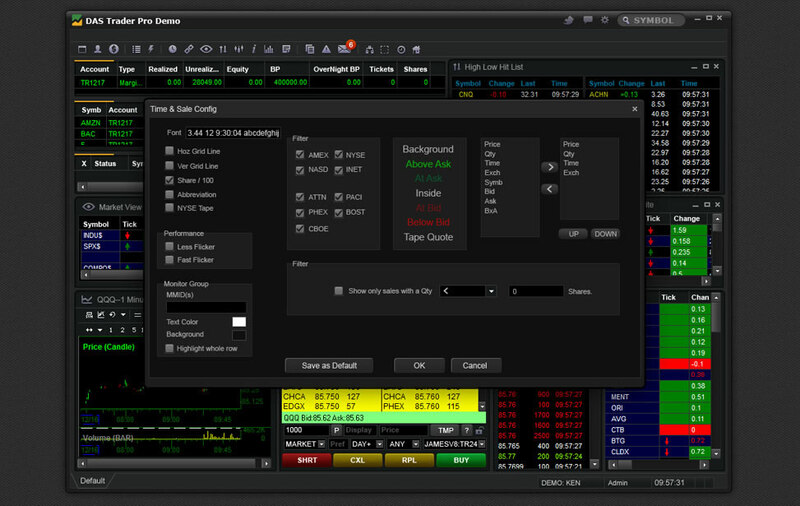 DAS Trader MTS is an order and risk management trading platform designed for a financial institution to send its omnibus orders to its broker’s or clearing firm’s execution and risk management platform. It enables foreign and domestic entities the ability to place real-time orders to the US equity markets via secured order entry connections in which all multiple accounts are transmitted to executing firms in one master account. 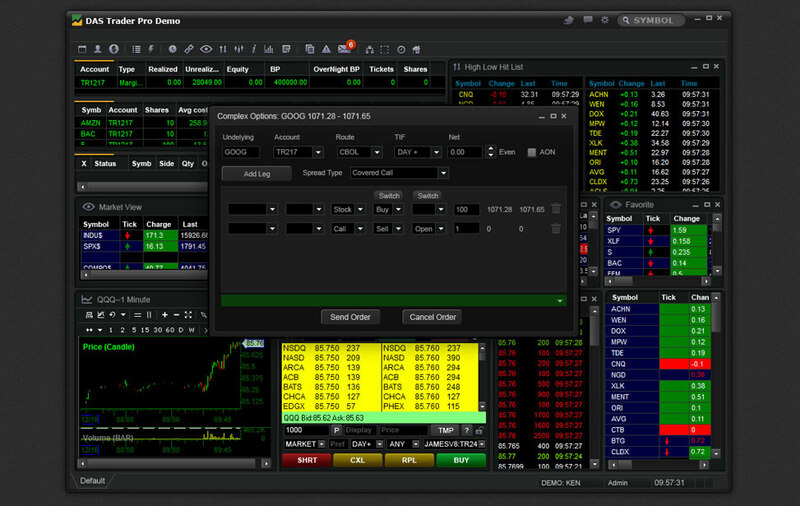 The controller of the master account will have the ability to monitor all transactions of the sub accounts from MTS along with applying all pre-trade risk management provided in the DAS suite. We also offer a post trade reporting tool which is integrated with the MTS to properly record trading historical information and portfolio management. 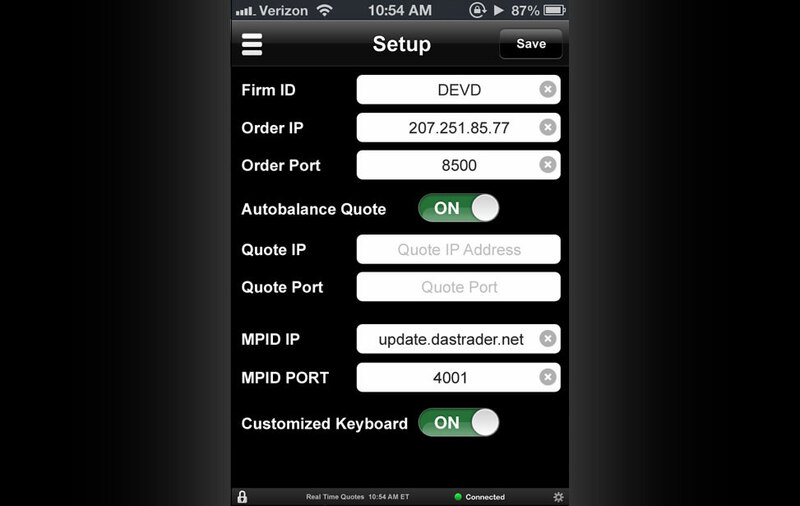 iDASTrader uses your iPhone, iPod, or iPad to manage your account and send orders using the DAS system. The same real time Level 2 market data is delivered directly to your iOS device! 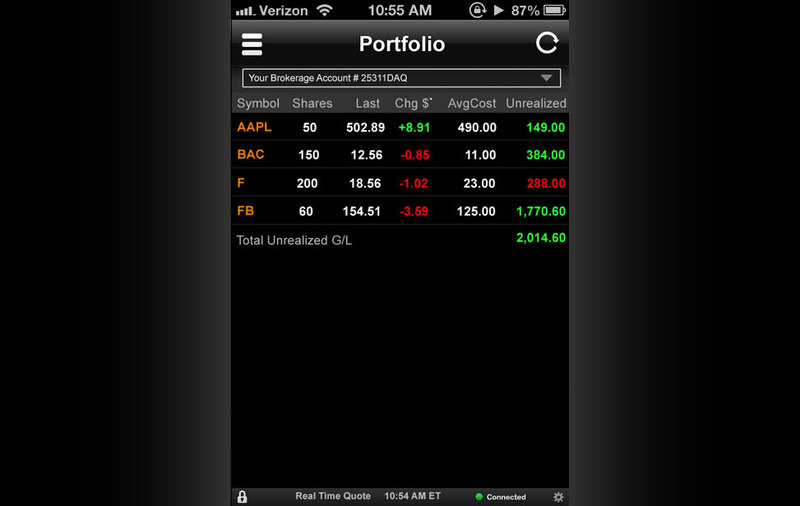 You can download the app by searching for iDAStrader in the Apple App store. 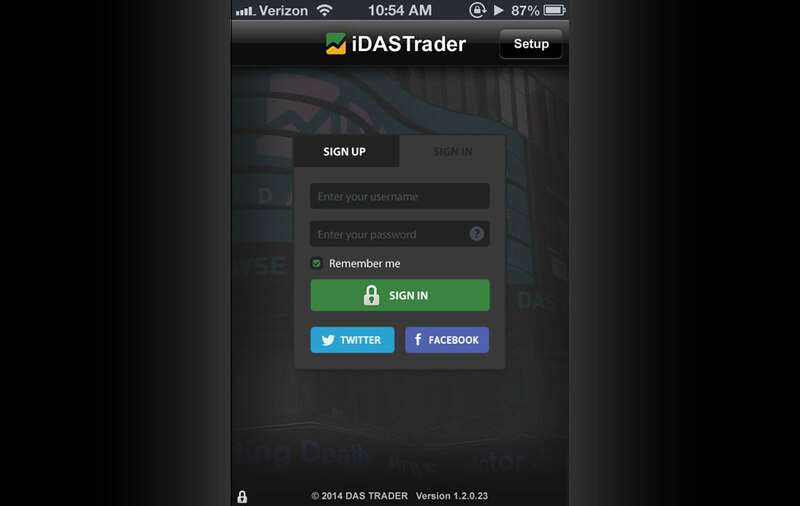 DAS Trader Mobile Web was optimized to fit the web browser of most smartphones, enabling for trading equities and options. 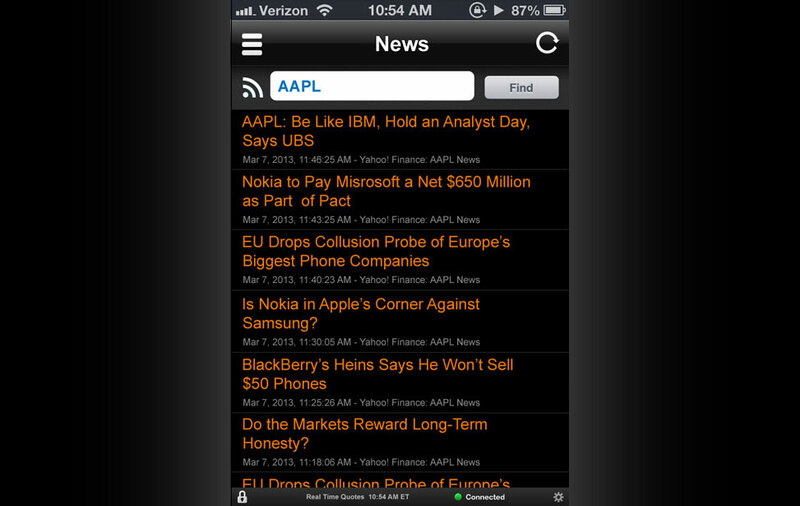 For easy access, simply bookmark the URL http://mobile.dastrader.net on your Blackberry, Windows, CyanogenMod, Nokia X Software, Sailfish, Symbian, Tizen, Android, IOS or any smart phone with a basic web browser. 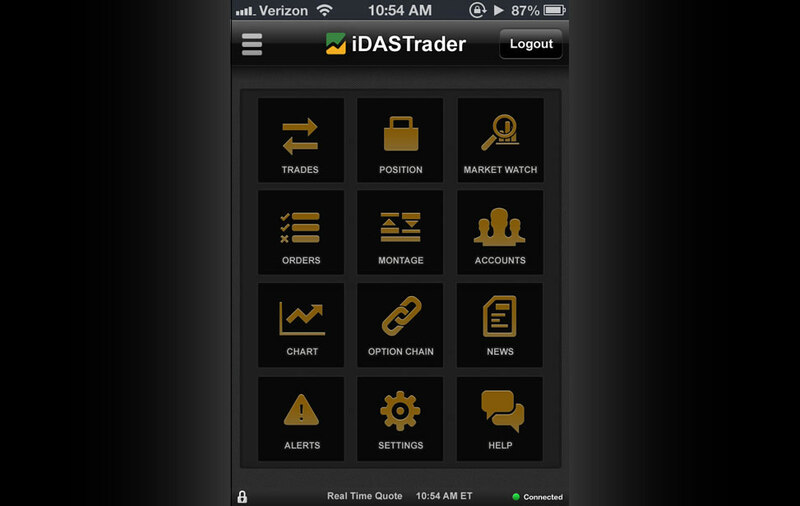 DASTrader Android app allows you to manage your account and send orders using the DAS system. 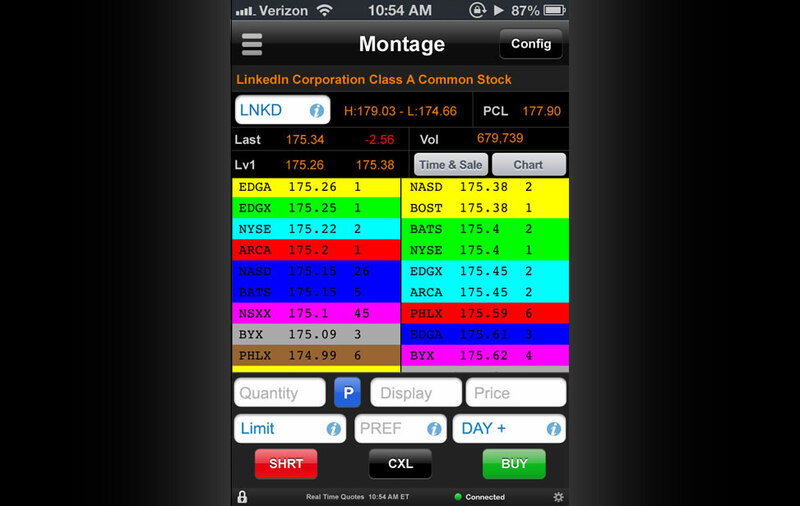 The same real time Level 2 market data is delivered directly to your Android device! 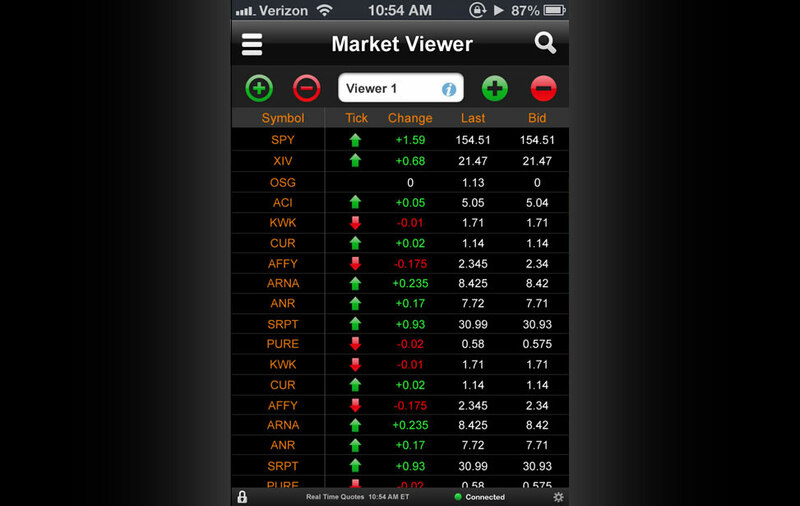 You can download the app by searching for DASTrader in the Google Play store. 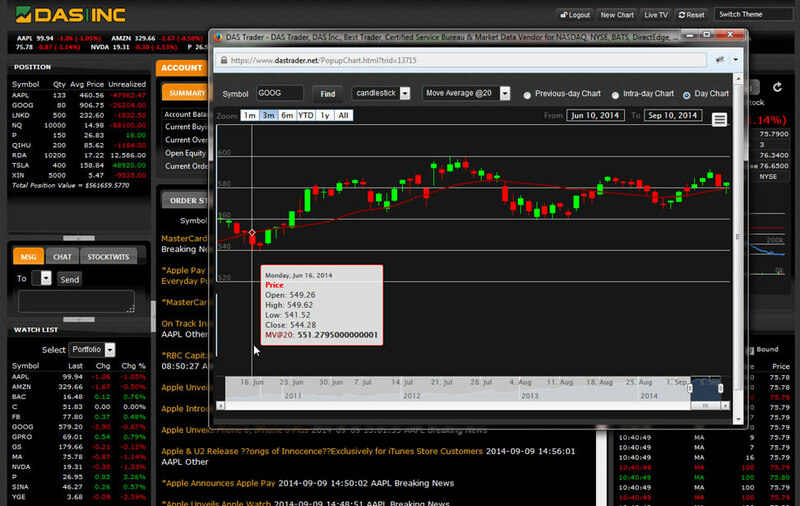 DAS Trader DMA FIX/API adheres to the standard of Financial Information Exchange (FIX) for the industry. It provides Direct Market Access (DMA) to various market destinations for high speed order execution and validation without compromising latency. Because our DMA FIX is co-located within the exchanges’ data center, our clients benefit by cutting time and cost in setting up connections to multiple venue options by just connecting to DAS infrastructure. 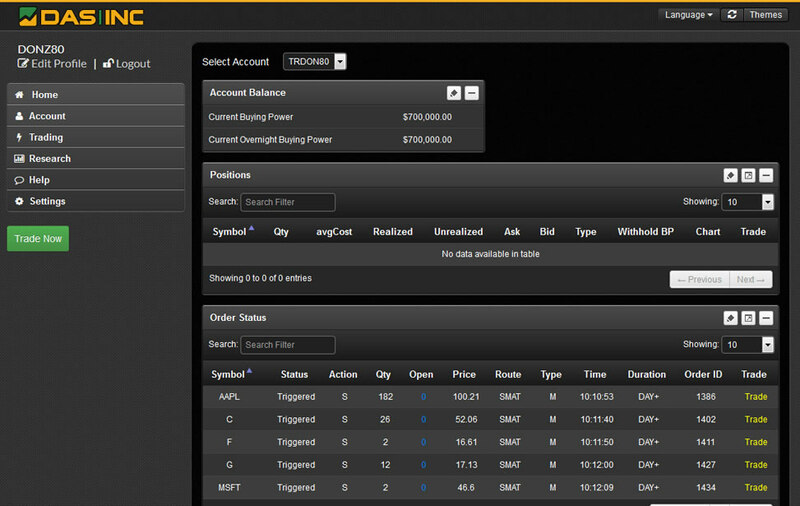 DAS Trader FIX/API – Automatically transmit, receive and cancel advanced order types, execution reports, order status, positions, liquidity flags, account balances, standardized market data for Nasdaq, Direct EDGE, BATS and more. 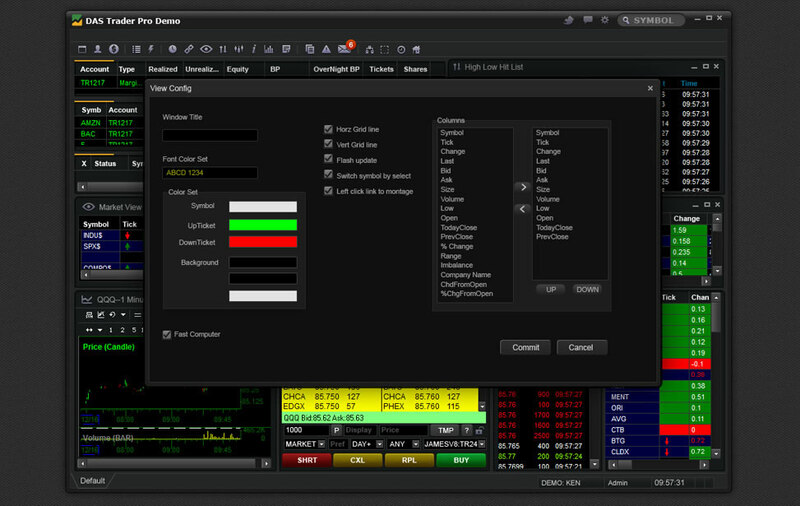 DAS Trader DMAr – Direct Market Access router is a smart routing system designed to offer access to multiple destinations using algorithmic strategies via one connection. DMAr allows our clients to benefit from the integrated package of our FIX, Trade Reporting Tools and Connectivity Service Bureau functionality. Having co-location within NASDAQ and gigabit dedicated point to point connections to the other exchanges provide our clients the advantage of having one of the lowest latency order confirmation and transactions to market centers. Our primary servers are hosted in Nasdaq's co-location, giving DAS Trader sub-millisecond order acknowledgment to INET/Nasdaq, NYSE/ARCA, BATS BZX, BATS BYX, EDGX, EDGA, CBSX and NSX. 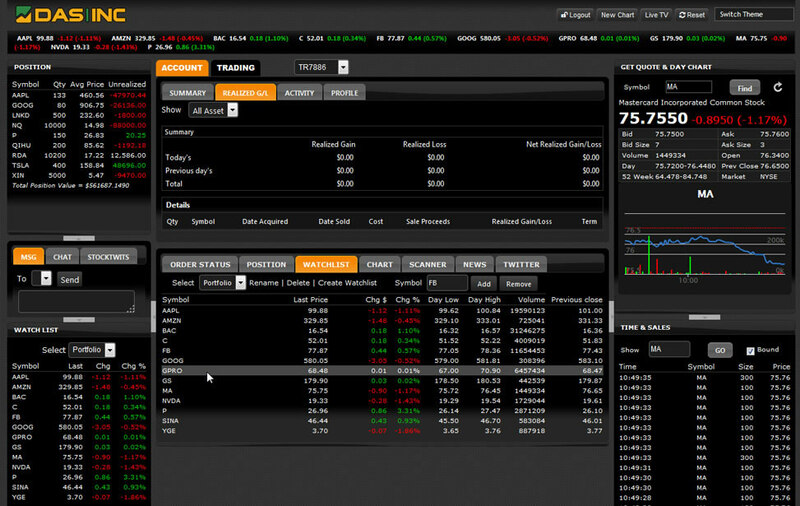 I have been pleased with the online trading platform and very pleased with the customer service I’ve received so far. 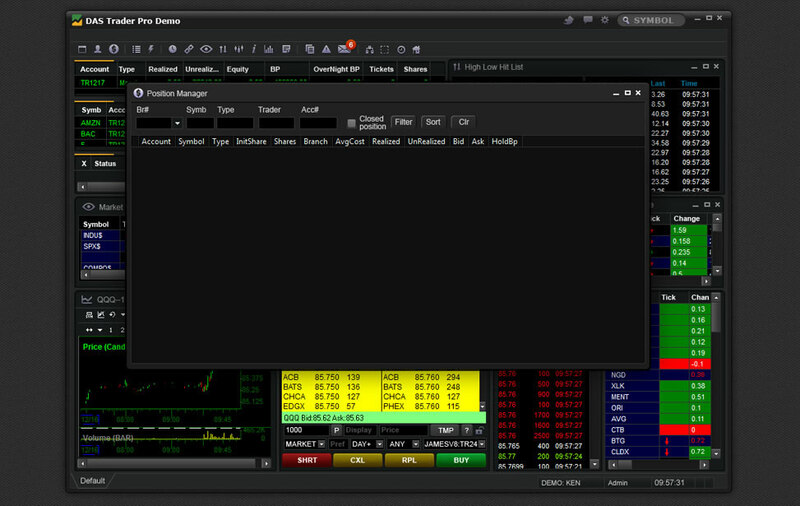 Over the past 20 years I tried and tested numerous trading platforms and I have to say that the DAS Trader Pro is by far the best platform. What I like most about this platform beside being simple to use, is the ease of zooming in and out of my charts along with the drawing tools that help me find the best support and resistance levels. 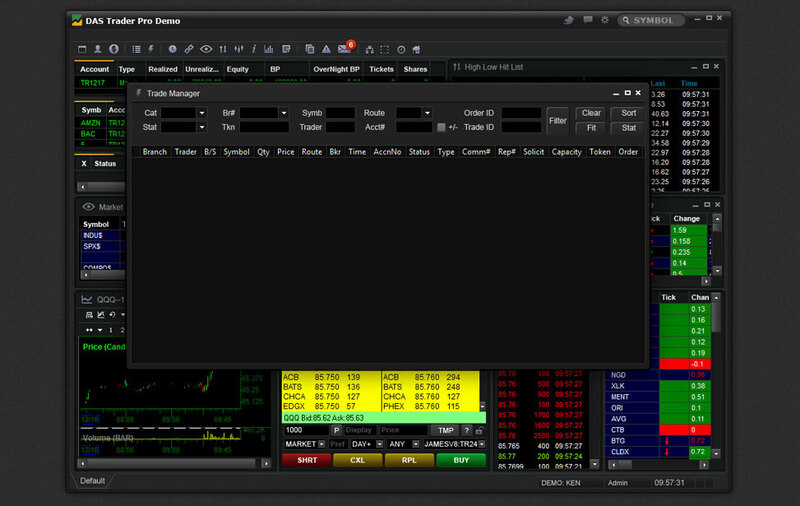 I share my screen all day teaching thousands of students how to day trade and swing trade using this platform at www.thestockwhisperer.com Other great features include the top 20 list, the ECN book and the multiple time and sales windows. I highly recommend this product. 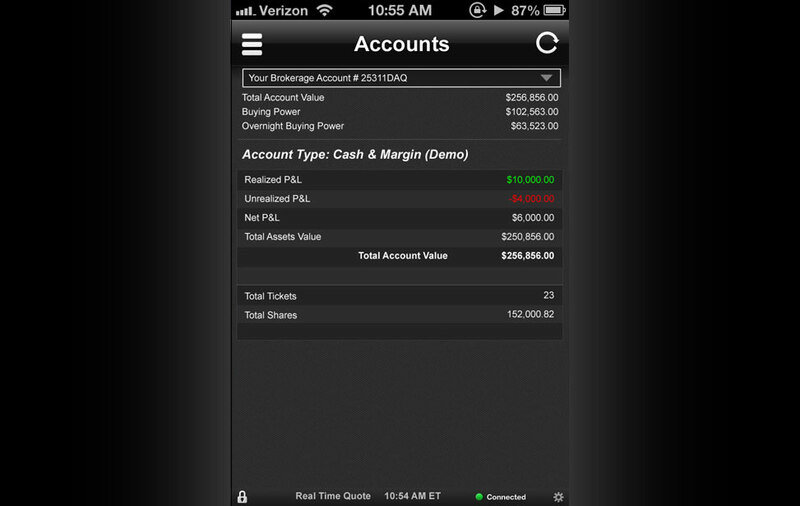 President and CEO, Cobra Trading, Inc.
We offer DAS for both our Cobra Trading and Venom Trading clients. 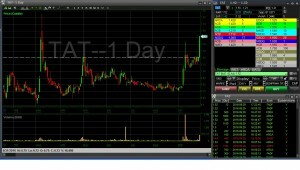 The platform is great for beginners and veterans alike. 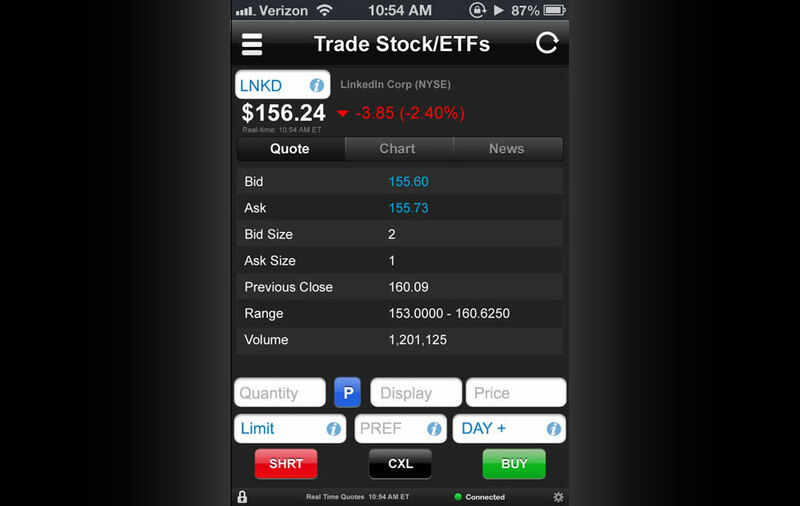 It offers tremendous value and ease of use, while offering a host of features such as advanced charting, mobile trading and a short locate monitor window. 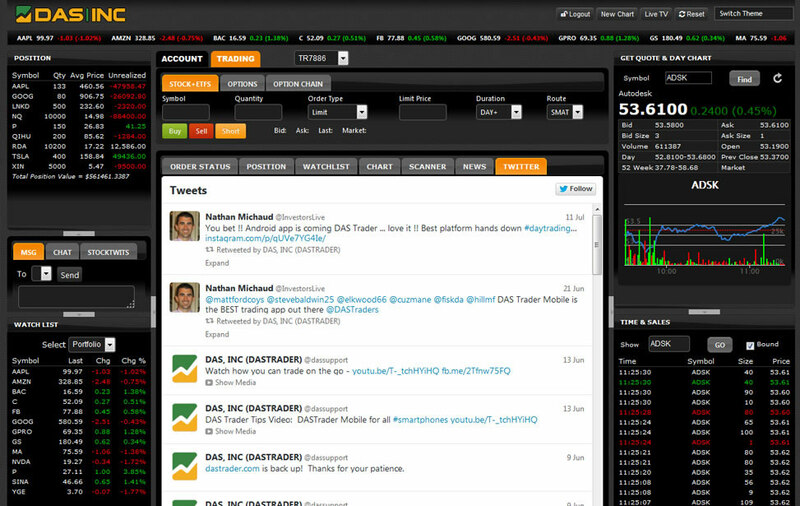 I have used DAS Trader for many years now and have referred many of my colleagues to your trading platform. Yes your product is of quality and does what we expect with trading but the MOST important aspect of a product is it’s support system. You’re staff that we rely on when we have questions, technical issues or problems. 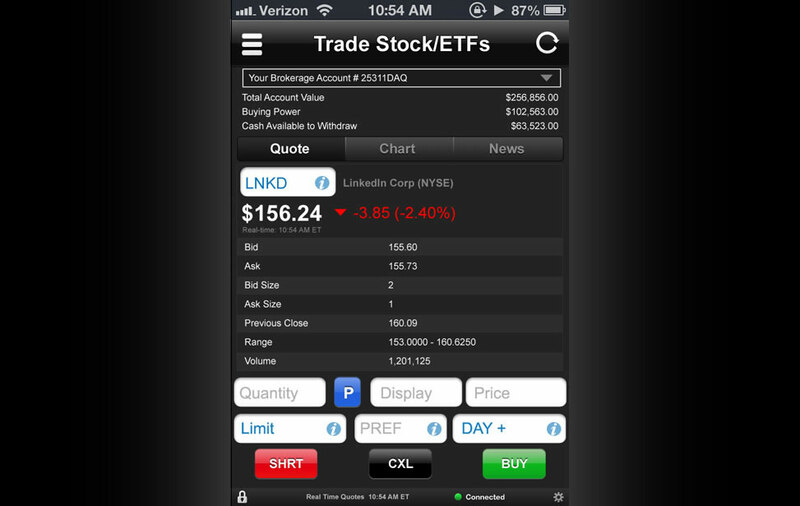 There are a ton of trading platforms on the market out there but as a financial analyst for a large institution I ALWAYS recommend your product! -Denver, CO. I just coordinated with the DAS support team and am impressed to see how they treat their customers, not just as a customer, but helping them out as their own family members. – Punjab, Pakistan. I must say that when i was in need of help, one of your technical advisers came through and put in the time to sort all of my issues out. I had some computer issues and platform issues i needed looking at. I did not expect this kind of service, but am really happy that i reached out to you. Thank you for the excellent service and a big thanks to the DAS support team for helping me out! – Forsby, Sweden. © 2003-2019 DAS Trader. All Rights Reserved. The Direct Access Software web site permits users to obtain access to information about DAS and its products. In providing this access, DAS recognizes the principles of privacy of personal information. When you visit the DAS web site, our web server identifies the IP address of your computer. In order to obtain access to portions of our web site (to download software, documents, files, view a demonstration, or to sign up for our mailing list) we may ask you to complete a registration form that identifies personal information about you or solicits your comments. We refer to all of this information as "Personal Information." We use personal information to obtain information regarding web site usage so that we can tailor our website content to meet your needs. We also may use personal information in our marketing and sales efforts. We do not share personal information with other non-affiliate companies. Deletion and Correction of Personal Information. Find out the details of any personal information we hold about you. Correct or update that personal information. Request that we delete that personal information. We value the information that you share with us, and consequently, your personal information is password-protected and its availability is limited to persons who have a need to know. DATA AND INFORMATION PROVIDED BY DASTRADER OR ANY OF ITS AFFILIATES, THEIR MEMBERS, DIRECTORS, OFFICERS, EMPLOYEES, AGENTS, AND CONTRACTORS ("DAS") IS FOR INFORMATIONAL PURPOSES ONLY, AND IS PROVIDED BY DAS ON AN "AS IS" BASIS. DAS EXPRESSLY DISCLAIMS ANY AND ALL WARRANTIES, EXPRESS OR IMPLIED, INCLUDING WITHOUT LIMITATION WARRANTIES OF MERCHANTABILITY AND FITNESS FOR A PARTICULAR PURPOSE AND A WARRANTY FOR NON-INFRINGEMENT, WITH RESPECT TO THE DATA AND INFORMATION. IN NO EVENT SHALL DAS BE LIABLE FOR ANY DIRECT, INDIRECT, INCIDENTAL, PUNITIVE, OR CONSEQUENTIAL DAMAGES OF ANY KIND WHATSOEVER (INCLUDING, BUT NOT LIMITED TO, LOST PROFITS, TRADING LOSSES, INTERNET SECURITY BREACHES AND DAMAGES THAT MAY RESULT FROM THE USE OF THE DATA AND INFORMATION, ANY DELAY OR INTERRUPTION OF SERVICE, OR OMISSIONS OR INACCURACIES IN THE INFORMATION) WITH RESPECT TO THE DATA AND INFORMATION. USER SHALL NOT, (I) INTERFERE WITH THE DAS SYSTEM BY USING VIRUSES OR ANY OTHER PROGRAMS OR TECHNOLOGY DESIGNED TO DISRUPT OR DAMAGE ANY SOFTWARE OR HARDWARE, (II) MODIFY, CREATE DERIVATIVE WORKS FROM, REVERSE ENGINEER, DECOMPILE OR DISASSEMBLE ANY TECHNOLOGY USED TO PROVIDE THE DAS SYSTEM, OR MAKE OR DISTRIBUTE ANY OTHER FORM OF, OR ANY DERIVATIVE WORK FROM THE SYSTEM, (III) USE ANY DEVICE OR PROCESS TO GAIN ACCESS TO PROPRIETARY INFORMATION RELATED TO THE DAS SYSTEM AND ITS SOFTWARE, (IV) ENGAGE IN ANY ACTIVITY THAT MATERIALLY INTERFERES WITH THE OPERATION OF THE TECHNOLOGY SERVICE. USER SHOULD NOT USE ANY TECHNOLOGY (NOT LIMITED TO VPN, PROXY, ETC.) KNOWN TO MASK OR HIDE COMPUTER INFORMATION AND IP ADDRESSES. USER AND AFFILIATES ARE AUTHORIZED TO USE EXCHANGE DATA. USER AND AFFILIATES MAY CREATE DERIVATIVE WORKS FROM THE EXCHANGE DATA. 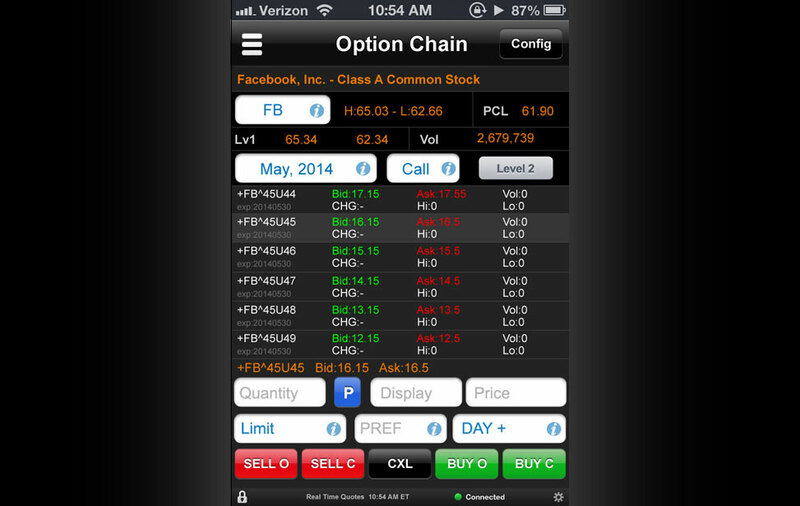 USER AND AFFILIATES MAY UTILIZE DERIVATIVE DATA AS NEEDED FOR TRADING PURPOSES. FINALLY, THE USER, AS A CONDITION TO VIEWING THE DATA AND INFORMATION, EXPRESSLY WAIVES ANY CLAIM IT MAY HAVE AGAINST DAS. PLEASE NOTE THAT ACCOUNTS WITH PREFIX ‘TR’ ARE DESIGNATED AS A TRAINING ACCOUNT. 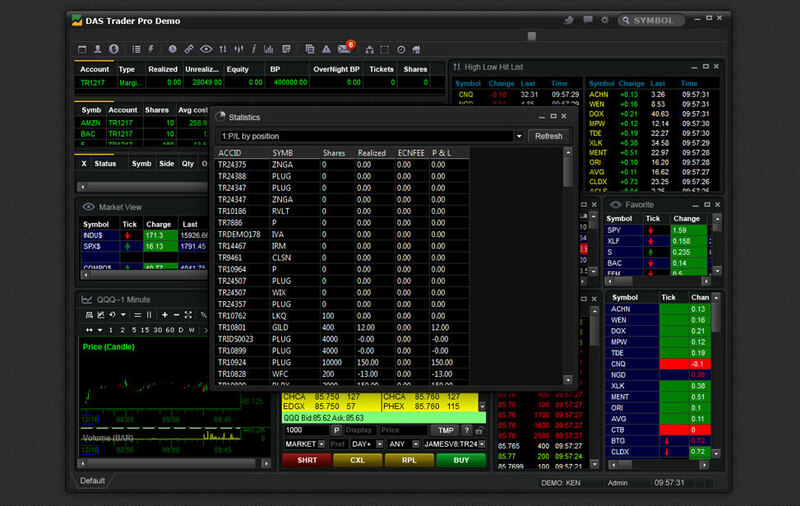 ALL TR ACCOUNT’S TRADES ARE IN SIMULATION FOR TRAINING PURPOSES ONLY. Running PRO on a cloud based virtualized desktop or a native virtualized Window’s environment. B) For the cloud based solution, the user must use Remote Connect app or similar remote access technology from the MAC or any non-windows OS to access PRO. Limited to one monitor but is quite stable and is suitable for someone who is not looking for Free solution want to use a non-Window OS and want access to his configured DAS PRO desktop remotely using any OS system that has Remote Connect available. Amazon offers a Free cloud based Virtual Server environment in which you can install Windows OS and run PRO. https://aws.amazon.com/, for more details please click here(PDF). 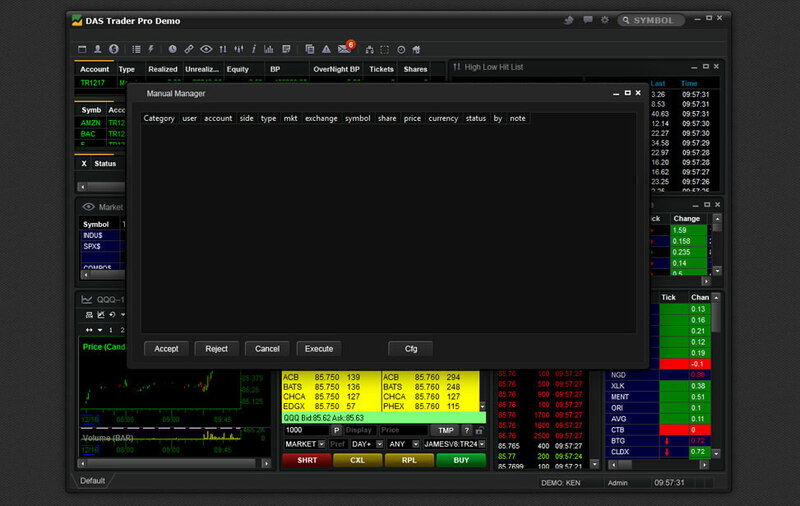 DASTrader PRO is intended and fully tested to be used in a Windows environment. Support is provided on our platform usage (on Windows). We do not provide support on Windows or MAC general usage. 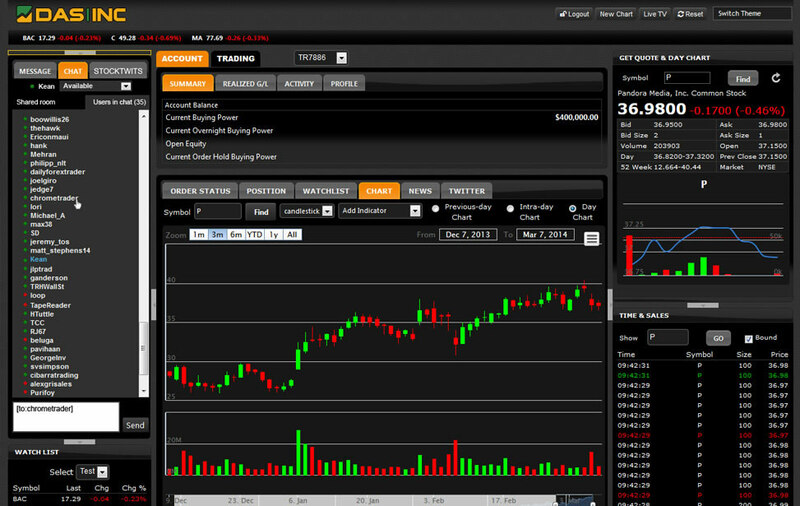 DAS (Direct Access Software) Trader is an industry leader in direct access trading technologies. 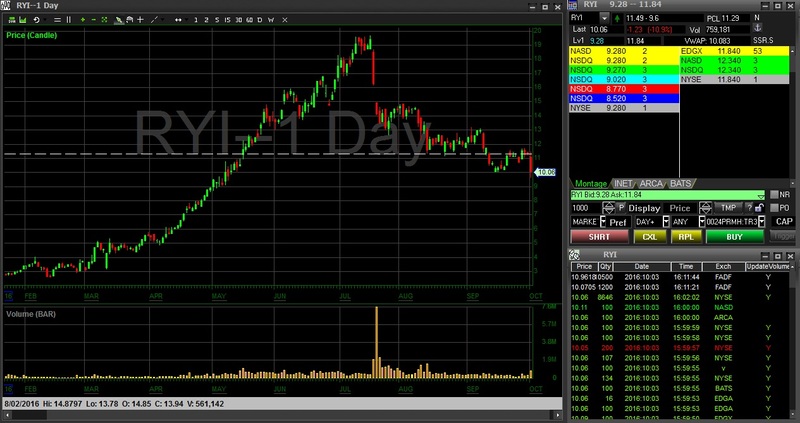 The company, founded 10 years ago by Karen Gentile, offers an end-to-end electronic trading solution to market participants of all sizes and expertise. On Oct. 19, Gentile rang the NYSE Euronext closing bell. Gentile, who runs DASInc. with partner Jun Liu, says the firm, developers of DAS Trader Pro, was honored by NYSE “for meeting standards as a service bureau and vendor for NYSE,” just the third firm to be given the distinction by the exchange. On October 18th, 2013, DAS|Inc will be ringing the closing bell in celebration of entry into NYSE Euronext Power Partners Program at the New York Stock Exchange. 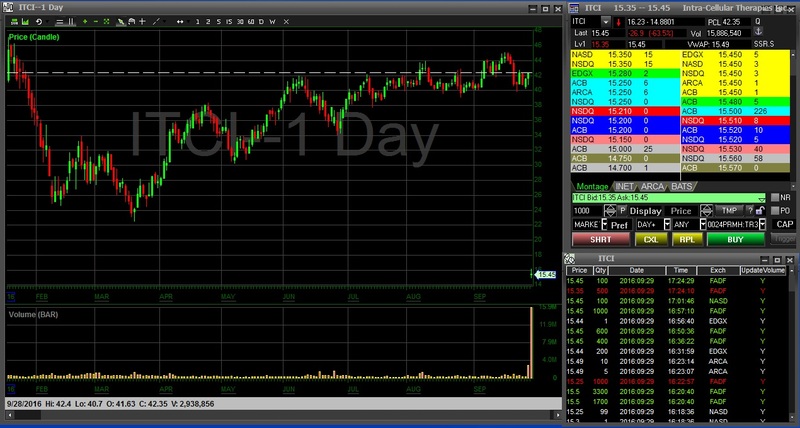 DAS|Inc is starting a new competition, Best Trader, as an introduction to its new Active Web Trader system. DAS|Inc now offers all of its products and services via CenterPoint Securities. 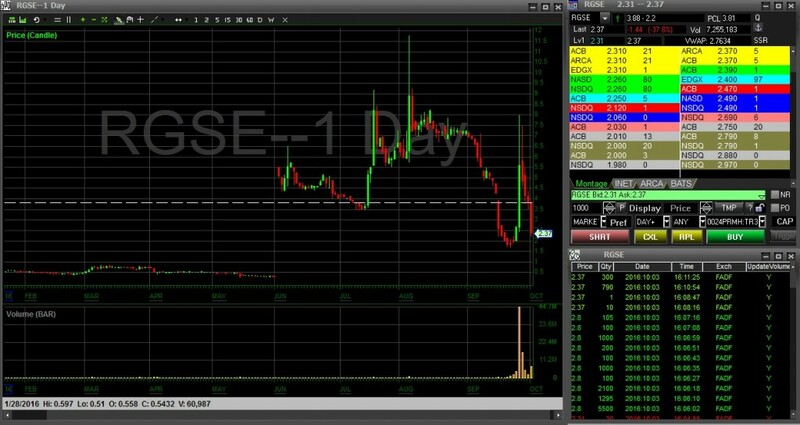 On May 10th, 2013, DAS|Inc rang the closing bell in celebration of the ten year anniversary of DAS Trader Pro, a low latency, robust trading platform. DAS Trader, an Industry Leader in direct access trading technologies which offers the brokerage and trading community end-to-end electronic trading solutions, will visit the NASDAQ MarketSite in Times Square. DAS|Inc has launched a limited API for mid and low frequency traders who wish to automate their strategies at a cost effective price. 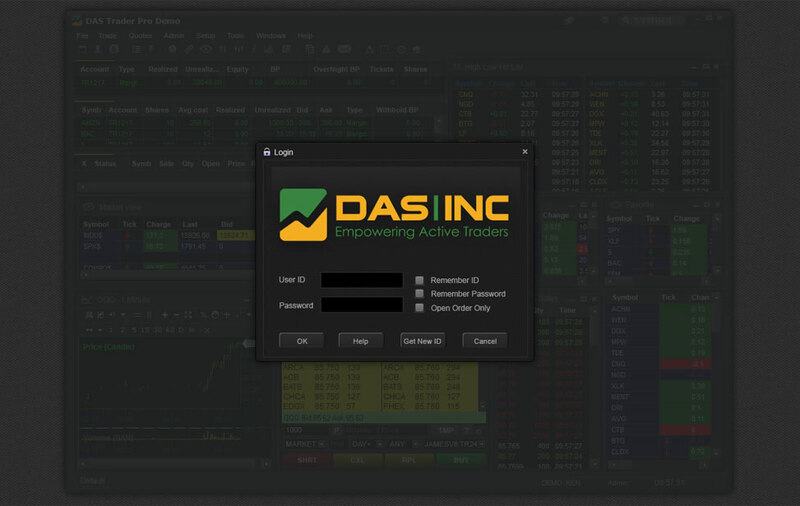 DAS|Inc has released a new limited API to make automated trading more available and affordable to individuals and small scale operations. 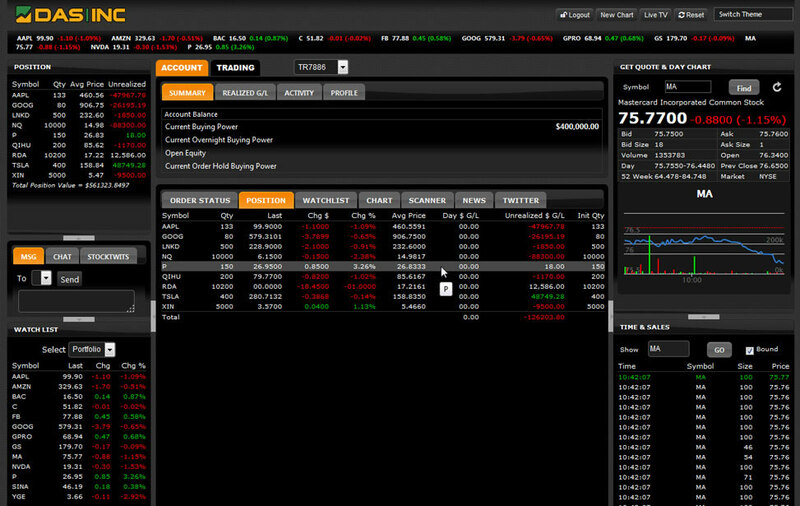 SureTrader.com, a broker dealer based in the Bahamas, becomes DAS|Inc’s newest client. DAS|INC expands its staff in 2011. DAS|INC appoints Demian Zadorin as its new Vice President of Sales. DAS|INC is pleased to announce the launch of the latest version of their flagship product, DAS|Pro version 2.0. DAS Inc. has launched DAS|RMA, an efficient Risk Management System in compliance with SEC Rule 15c3-5. Benzinga staff writer, Louis Bedigian interviews DAS CEO Karen Gentile about changing trends in electronic trading and DAS Inc.’s impact on this evolving field. DAS Inc. has been awarded Platinum Partnership by NASDAQ OMX Certified Partners Program. 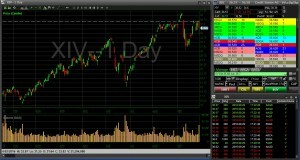 The NASDAQ most active stock is Sirius XM Holdings Inc. (SIRI). 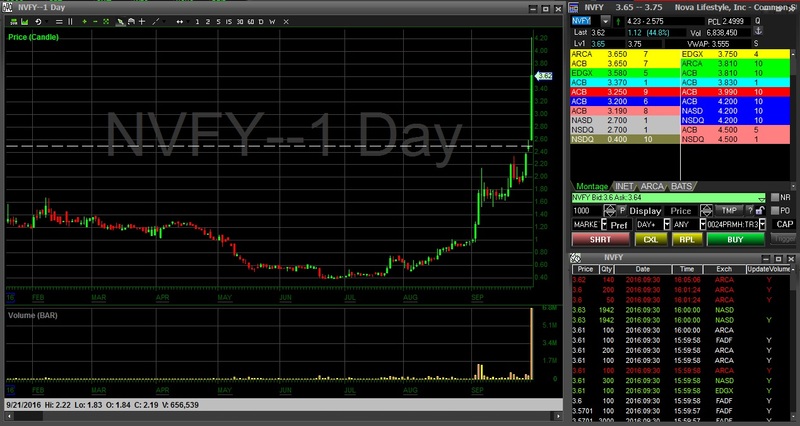 The NASDAQ top gainer is Nova Lifestyle, Inc. (NVFY). 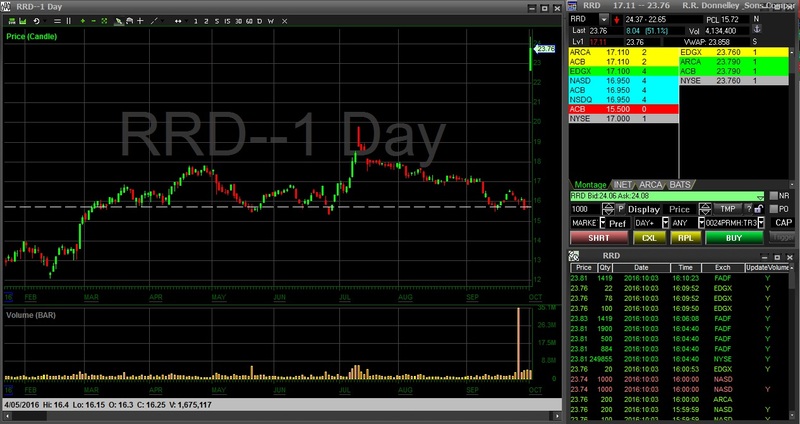 The NASDAQ top loser is Real Goods Solar, Inc. (RGSE). 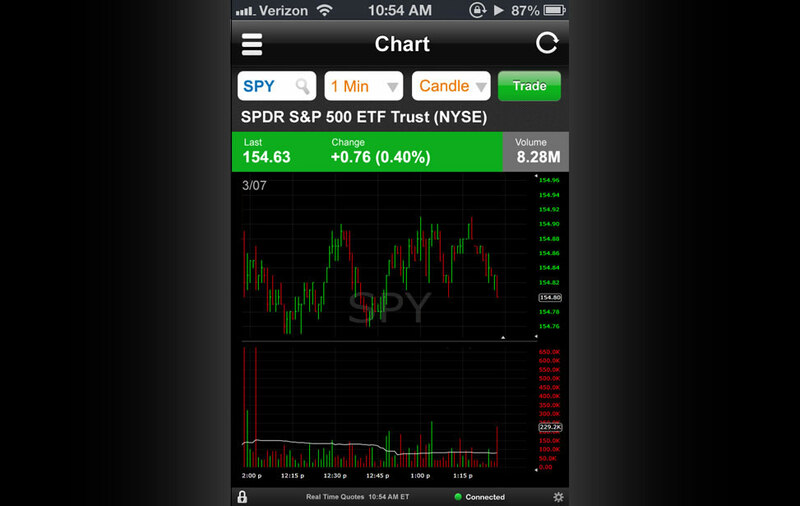 The NYSE most active stock is SPDR S&P 500 ETF (SPY). 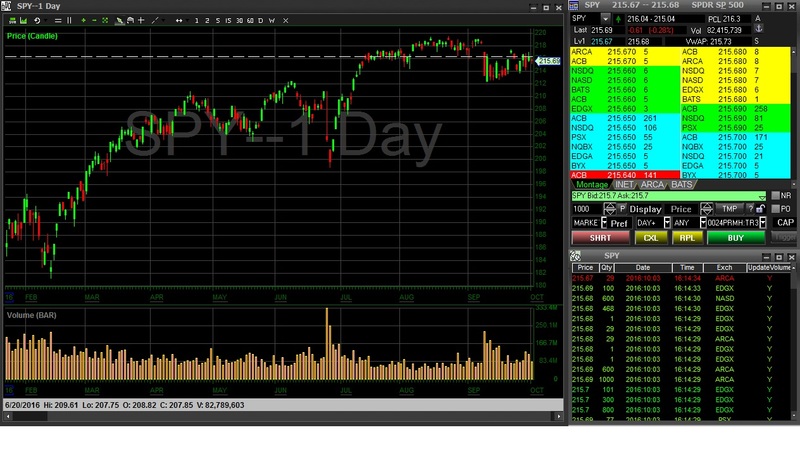 The NYSE top gainer is R.R. 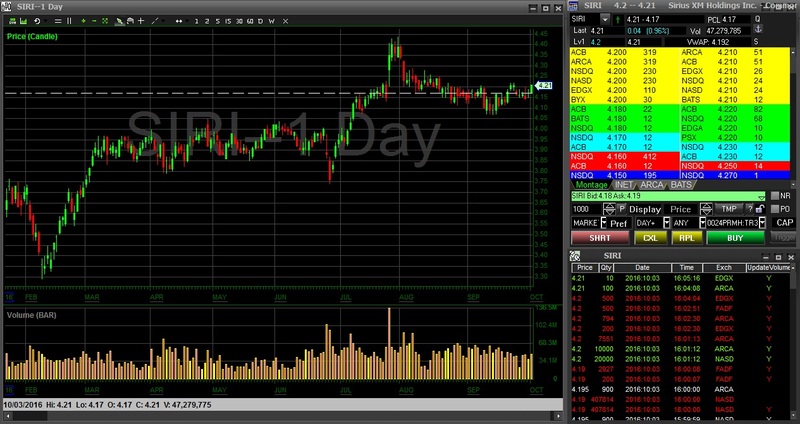 Donnelley & Sons Company (RRD). 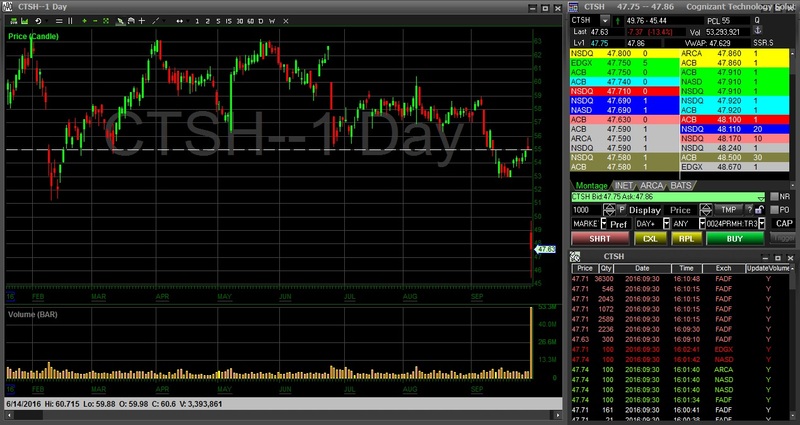 The NYSE top loser is Ryerson Holding Corporation (RYI). 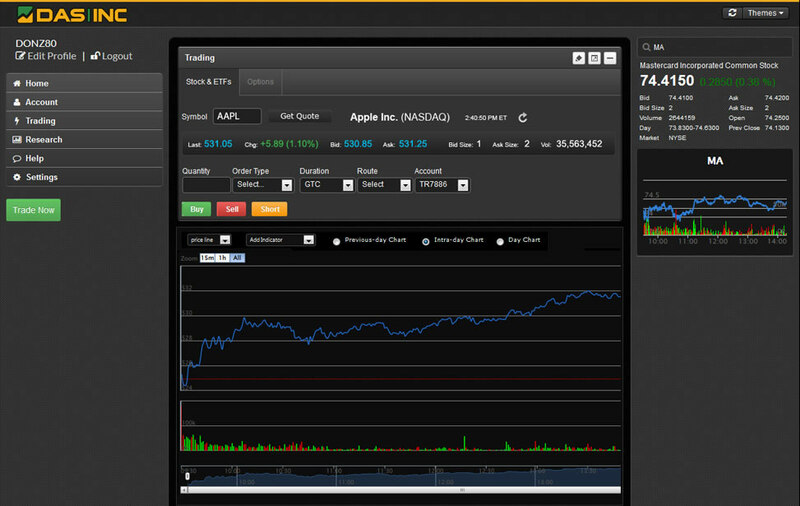 The NASDAQ most active stock is Cognizant Technology Solutions Corporation (CTSH). The NASDAQ top loser is Delcath Systems, Inc. (DCTH). 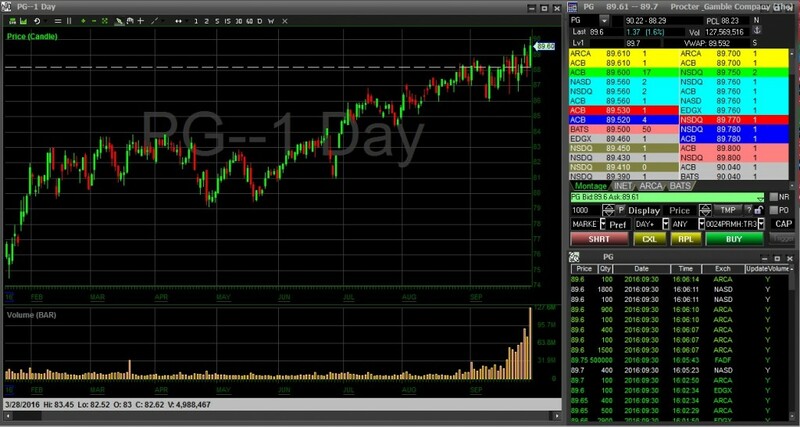 The NYSE most active stock is The Procter & Gamble Company (PG). 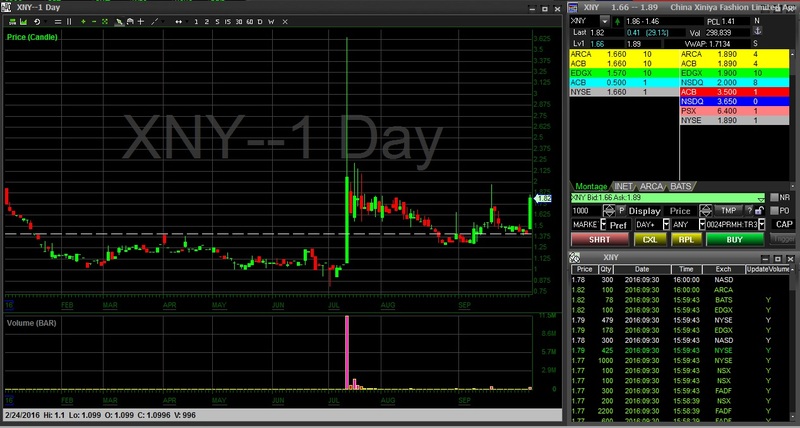 The NYSE top gainer is China Xiniya Fashion Limited (XNY). 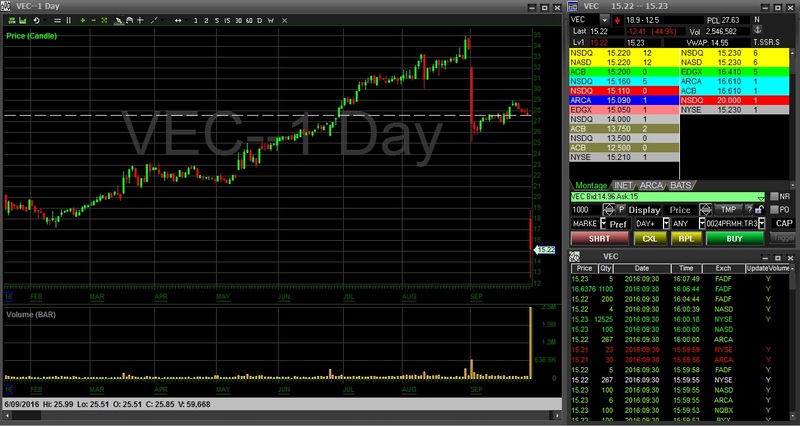 The NYSE top loser is Vectrus, Inc. (VEC). 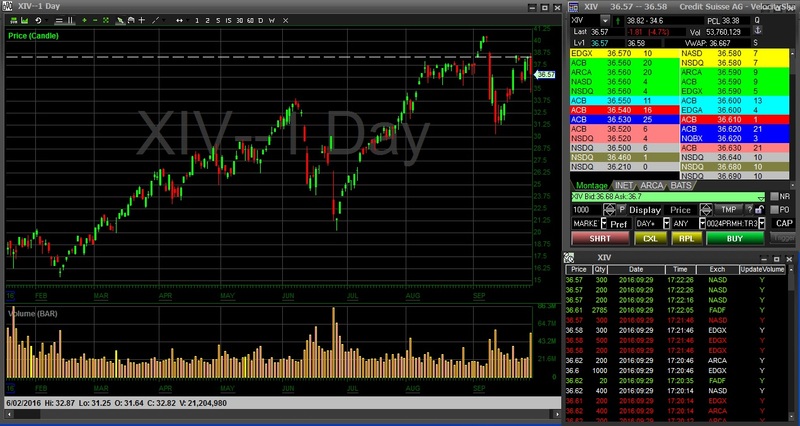 The NASDAQ most active stock is VelocityShares Daily Inverse VIX ST ETN (XIV). The NASDAQ top gainer is Catabasis Pharmaceudticals, Inc (CATB). 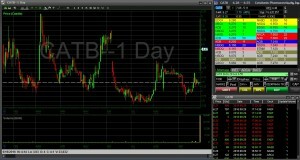 The NASDAQ top loser is Intra-Cellular Therapies, Inc (ITCI). 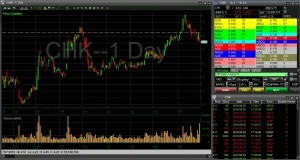 The NYSE most active stock is Chesapeake Energy Corporation (CHK). 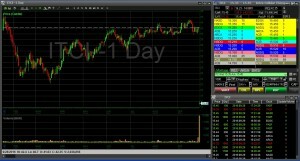 The NYSE top gainer is TransAtlantic Petroleum Ltd (TAT).